Home > Gezondheid > Voeding > Raw food > Do you know what happens if you drink coconut water for seven days? Do you know what happens if you drink coconut water for seven days? (Diet of Life | Anastasia) Is coconut water as magical as everyone says it is? Most of you are probably familiar with coconut oil and the numerous benefits it offers.In this article, we will look into some of the major benefits that accrue by coconut water consumption. 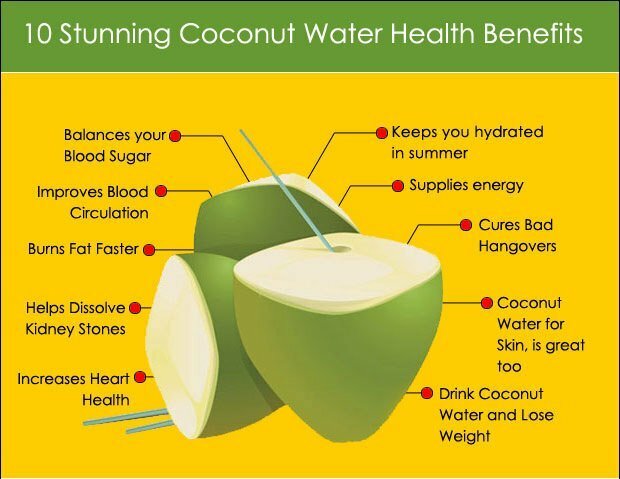 Many people are not aware that coconut water has virtually similar structure to the blood plasma which is present in the bloodstream in all humans. Therefore, this miraculous water made extensive use in the past war conflicts when it was frequently used as a substitute for blood plasma because it was vital for the survival of vast number of war casualties. The numerous wounded and injured people were given coconut water during terrible and prolonged battles. Nowadays this water is used in almost all countries of the world, so it is massively popular. The coconut can be found in many markets worldwide, giving you the opportunity to have the overall health advantages of this extraordinary fruit for yourself! Although the coconut water does not taste as deliciously as pizza, you shouldn’t look away from what is considered one of the healthiest detoxifying waters in the world. What happens to your body when you drink coconut water? Coconut water helps you strengthen your immune system. It kills the bacteria that cause urinary tract infections, gonorrhea, gum disease and the viruses that cause influenza, infectious diseases and typhoid. Drinking coconut water can offer a great boost of energy for those who suffer from chronic fatigue. The recommended dose is 40 to 50 ml taken daily. While the coconut water undeniably increases energy levels, there is another very important benefit: it stimulates the production of thyroid hormones. 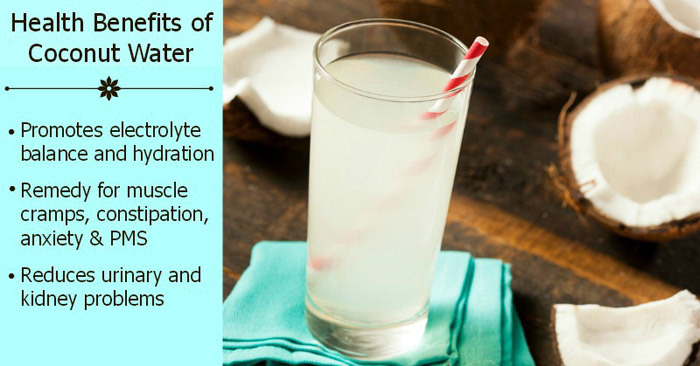 Acting as a natural diuretic, this water is also beneficial to anyone who suffers from kidney disorders. Likewise, it benefits the urinary tract and bladder channels leaving them clean and infection-free; it eliminates toxins from the body and reduces problems caused by kidney stones. Coconut water improves digestion too because it contains high levels of fiber. If consumed regularly, it alleviates problems caused by stomach acid. This water contains very little fat, so it can be consumed in large quantities. It gives you the feeling of satiety and reduces appetite, thus helping you to slim down and maintain an attractive silhouette! If you suffer from acne or have a combined dry-oily skin, you can soak a cotton ball in coconut water, and apply it to the skin. It cleanses and invigorates the skin, and, unlike numerous creams and lotions, it does not close the pores. This water also finds use as a natural body purifier: when mixed with olive oil the coconut water removes intestinal parasites. Experts say that coconut water can be a valuable help to naturally solve some health problems during pregnancy as well! One full cup of coconut water in the morning balances electrolytes whose imbalance can sometimes be the cause for hypertension, more commonly known as high blood pressure. Speaking of the mornings, we all occasionally happen to drink a bit more at late-night events, and “oddly enough” the next morning we wake up with a hangover. So, next time you plead a headache after a razzle-dazzle party recall this miracle water which will help you get rid of the hangover. By drinking coconut water you also compensate the lost liquids and overcome the nausea that is frequently associated with hangover. in a word: Good riddance to bad rubbish! What more could anyone wish from drinking a single cup of water? One full cup of coconut water per day will also be sufficient for moisturizing your skin and keeping it shinny throughout the day. Keep in mind to drink this water after strenuous physical activities too. It’s refreshing and almost as pure as the natural spring water! By Anastasia - An accomplished professional writer who uses her assets to explore Mother Nature’s herbal remedies, vegetables and fruits for human well-being. For many years, she has been writing articles on health, nutrition, and gardening, based on her own long experience and research prowess. Indien ik geen gevoel voor humor had, dan zou ik allang geleden zelfmoord hebben gepleegd.